The nastiest brake kit ever installed on a VW. | Essex Parts Services, Inc.
We're into our next round of development on our Essex Designed AP Racing Radi-CAL Competition Brake Kits, and the Mk6 and Mk7 Volkswagen GTI are next in the queue. Significant power upgrades are cheap and cheerful with the 2.0 turbo engine, and many of our customers with these cars are pushing 2-3 times stock power levels. 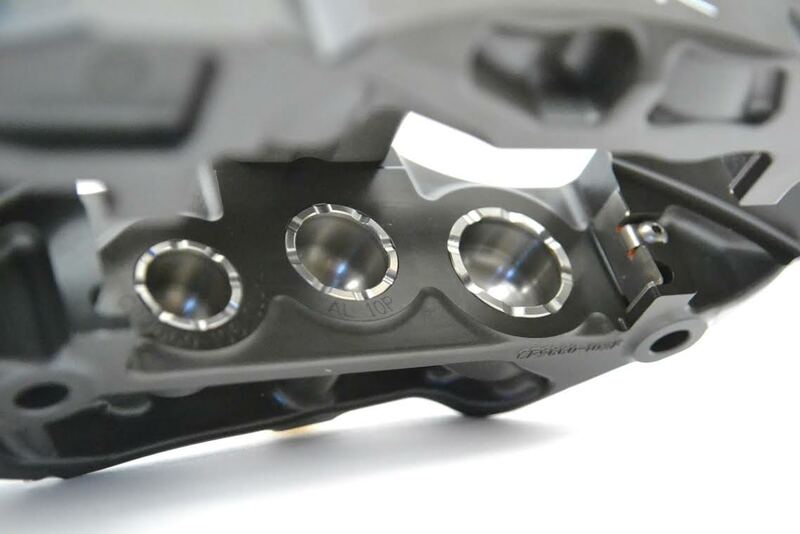 Given the overall performance potential of these platforms, the primitive OEM single piston sliding calipers and heavy, one-piece discs are marginal at best, particularly if the car is being tracked. We've decided to offer an Essex Designed AP Racing Radi-CAL Competition Brake Kit that brings the car's ability to scrub speed in line with it's ability to reach speed. In the process, we've also shed an enormous amount of unsprung weight (33 lbs. off the nose of the Mk7! ), which will improve the car's acceleration and handling, in addition to the usual benefits an enhanced brake system provides. We've settled on the CP9660/355mm setup as the ideal choice for the GTI. Our GTI kits will be virtually identical to this offering for the C7 Corvette, except the pistons will be sized specifically for the VW platforms to maintain proper brake balance. We went with a disc size that fits easily in most 18" wheels, and can even be crammed into some 17's. Below is how our kits stack up vs. the OEM equipment on the 2012 and 2016 models that we measured. Compared to the Mk6 GTI brakes, we're taking a fairly dramatic step up in terms of disc size, going from a 312x25mm to a 355x32mm. Our discs offer far more thermal mass with their larger diameter and thickness, as well as enhanced cooling ability due to the 72 directional vanes. Despite the drastic size increase, our disc is incredibly 2 lbs. lighter than an OEM unit! The AP Racing Pro5000R Radi-CAL calipers are also a remarkable departure from the OEM pieces. The OEM caliper is frankly a bit of a dinosaur, with a feature set created before most of our readers were even born. By comparison, our six piston CP9660 Radi-CAL is futuristic automotive art. 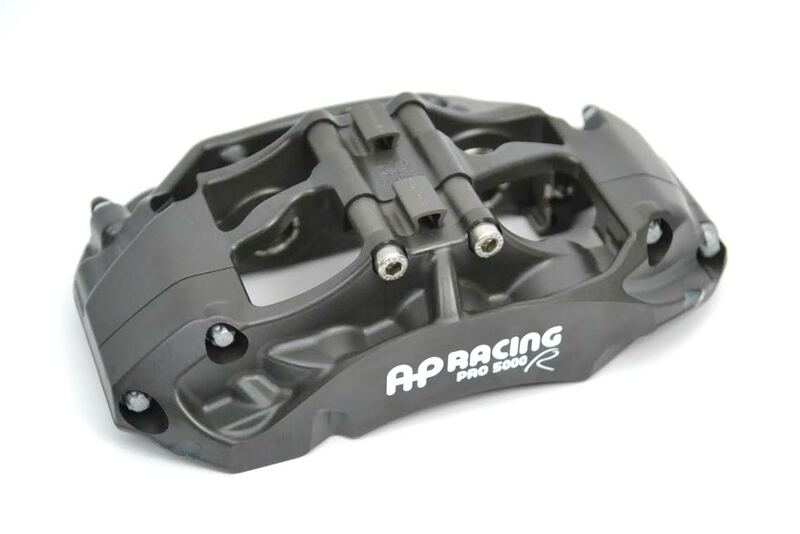 AP Racing's Radi-CAL design framework, domed-back, ventilated stainless steel pistons with anti-knockback springs, high temperature seals, and a removable bridge for quick pad changes are just a few of the features that allow our calipers to perform at a level the OEM equipment could never hope to achieve. With the exception of lightweight wheels, you won't find an easier way to remove crucial unsprung mass from your VW. Rather than a sliding one-piston caliper that weighs 14.8 lbs., our six piston CP9660 caliper tips the scales at a feathery 6.1 lbs.! OEM disc= One-piece 312x25mm, 40 non-directional vanes, 18.7 lbs. Essex/AP Racing Disc= Two-piece, fully-floating 355x32mm, 72 directional vanes, 17.0 lbs. Overall, our kit drops approximately 12 unsprung lbs. off the nose, despite being much larger! Another great feature of our Mk6 kit is that it clears the OEM 18" wheel by about 5-6mm without a spacer. Our Mk7 Golf test car had the optional larger brake system pulled from the Golf R. While the calipers look a little fancier, they're still very pedestrian in terms of their specification. Essentially, they're just a larger, logo'd version of the base brakes. As with the base brakes, they are a single piston slider, and they weigh a whopping 16 lbs. each! The discs are similarly ordinary at 340x30mm, with 40 non-directional pillar vanes, and weigh a portly 23.4 lbs. Our kit shaves roughly 33 lbs. of unsprung weight off the nose, despite going to substantially larger components! Our kit wouldn't quite clear the OEM 18x7.5" wheel (a 5mm spacer would be sufficient), but had no trouble clearing the 18x8" Volk RE30 CSII's our test car wore. Interestingly, these wheels shaved 9-10 lbs. per corner as well. If you went with these wheels and our front brake kit, you'd be dropping over 70 lbs. of unsprung weight from the car! That's Great, but When I Get One!?! We expect to start shipping Mk7 GTI kits right around the first of 2017. The Mk6 kit should start shipping in late January. Check out the vid below to better understand how an Essex Designed Competition Brake Kit can improve your day at the track.